Passed last friday with 907. Sims still the same, ACL2, EIGRP and VTP. VTP were 5 questions but the same questions from 9tut. ACL2 make sure you check the modifications. They made a combination last friday 4 rules and only 3 able to make so the thing was to combine 2 rules together. Check http://www.9tut.com and this dump is still vallid!!! I have passed ccna last week, i'd got 973 points. Four questions not from this pool. Labs: Acl2, vtp, eigrp. I've used this dump and 9tut. Exam was easy, all questions known, labs were ACL2, EIGRP and VTP. Thanks a lot to 9tut and examcollection!!! Something new as a question, but it is still a valid dump! Used it with prepking 680q. Sorry for my fault with PrepKing & Pass4Sure, I'm used the PrepKing, Acme's Actual Test, SIM from 9tut. Thanks to Acme & PrepKing, 9tut Also. I'm Pass the Test with "920 Pt" In Myanmar Inspiration Exam Center.I'm Think Acme's ActualTest File is 100% Valid in Drag & Drop. PrepKing is more accurate on other question type. Thanks to Acme & Pass4Sure, 9tut Also. I'm Pass the Test with "920 Pt" In Myanmar Inspiration Exam Center.I'm Think This Dump is 95% Valid, but Drag & Drop were Useful and "100%" Valid. Pass4Sure is more accurate on other question type. -EIGRP was also from 9tut, i removed incorrect AS from R3 then add the correct one, and from main router, I removed the phantom network and replaced it with the correct one. People passed the test !!!! No one mentioned where their majority of questions came up on the test. Please inform !!!! Passed today of score 933/1000.. Sims we're ACL, VTP and EIGRP..
most of the questions were in this dump only 2 to 3 questions weren't.. I passed with 961/1000. this dump is 100% valid. only 3 questions were out of dumps. I really dont remember 1 is about frame-relay, 2nd dhcp, 3rd vlan. I took the exam on 15th feb 2013. thanks guys. I passed, many thanks acme676, this dump helped me. also i have a copy of the todd lammel study guide 6th edition but does anybody know a free web site where i can do some labs?? I cleared at last saturday and still valid. what are the changes in labs? 1. go to switch of building_100 console and type show running confi commnd. the output of this command will show you the ip adress of the vlan1 and ip address of the default gateway. 2. i think the mamagement domain in this question refer to the vlan1 (the default vlan) so take the subnet of this ip address and find the last available ip address in that subnet. 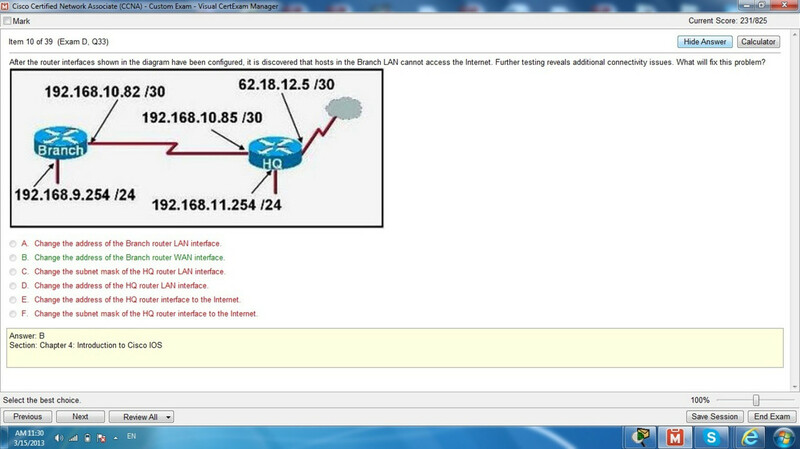 3. assign it to vlan1 in switch_210 and add the same default gateway as switch_100. 4. Type command show vtp status in switch_100 and find its domain. go to switch_210 and type vtp domain domain_name command. I believe this completes the configuration. I cleared ccna at 24-1-2013. 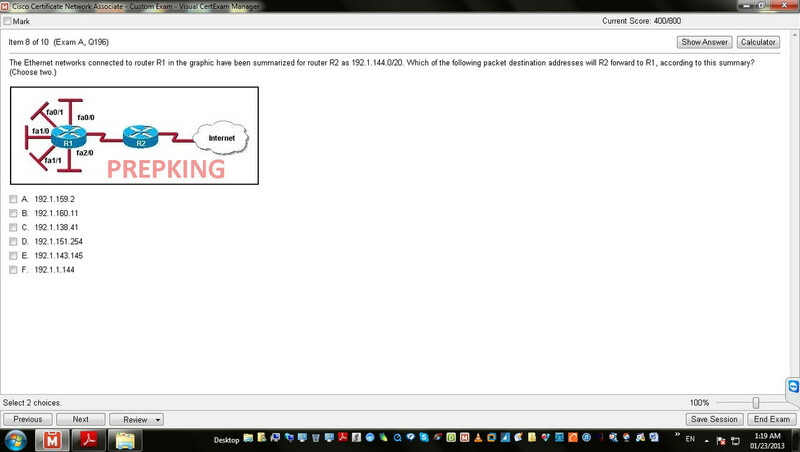 I used Cisco.ActualTests.640-802.v2012-12-18.by.Acme.676q.vce dump and 9tut sims. My sims are eigrp , vtp , acl2. I scored 925/1000. Dump still valid. Passed tody with 960/1000. I had acl 2, eigrp and vtp. I used 9tut and this .vce file. Cleared the CCNA today with 960 marks with my first attempt. Did only the prepking 680Q. It is still valid. 99% questions are same. Some modifications are in but the answers are same.:) . Labs are VTP, ACL2 and EIGRP. All labs and drag and drops are in the 9 tut. Passed today 987 of 1000.
cleared CCNA on saturday. i followed prepking 680 & 9tut. got eigrp, acl2 & vtp sims. ip addresses were different. questns were easy. wat i wud like to suggest is study the dumps using vce app.one by one chapter. it'l be easy to understand & u can finish it in 1 week. all the best!! Solution: The subnet mask is /20. So you have 4 bits in the 3rd octet for the hosts. This means you have a magic number of 2^4=16. Your subnet starts at 192.1.144.0/20. The next subnet with a subnet mask /20 starts at 192.1.144+16.0 = 192.168.160.0/20. So you can address your hosts from 192.1.144.1 to 192.168.159.254. so A & D are the correct answer. What are the current Labs???? I test on 1/26 AM. Guys i am planning to give the exam on 24th 01, any special attention i need to take care of. M referring prepking 680 and EIGRP/VTP/Access list Lab. Anything more. What are the current Labs, test on the 22nd.